Description I Bedroomed Top floor Attic flat with a large lounge with fitted kitchen, a double bedroom. There is a bathroom with bath and electric over bath shower, also utility cupboard where washing machine is set. 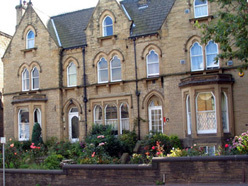 The flat is part of a large Victorian house that has intercom access and car parking at rear. Useful for town centre amenities and M62 Motorway junctions UNFURNISHED. Gas & Water bills included. Tenants are responsible for the payment of Electricity & T V Licence.